I must really go back and crack open Proust again. I think it is the size that puts me off. This volume sounds intriguing to me. Yesterday I was talking to a group of gay and trans friends about gaydar. A couple of the men present came out in their late 40s when everyone else knew they were gay BUT they did not. I imagine Proust’s angle would be interesting especially because the subject could not be discussed openly in his time. Even today, for all we believe we are enlightened about homosexuality, the lived experience is much more complicated, even confusing, than many understand. Great post, Max. It’s hard to stop writing about it, isn’t it? If I had to pick a book to stay on a desert island, I’d take In Search of Lost Time. There’s so much to discover, you could read it so many times and always discover something new. I thought this volume was really daring for the time. 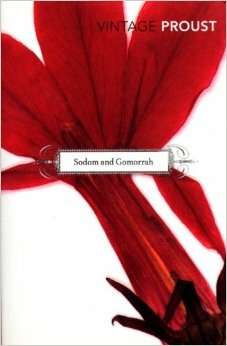 I’ve never read anything like this about homosexuality before or during Proust’s time. One can argue there were several notorious gays in his time (Cocteau, Radiguet, Gide) and that he was part of the gay scene too. He manages to picture many aspects, from their need to hide to the quiet acceptance of the society that looks the other way. Charlus’s love affairs also show the readers of that time and later (homosexuality was a crime in France until 1981) that these affairs are about love and lust, just like the ones between a man and a woman. He introduces some “normalcy”. In this volume, we also start to discove the Narrator’s dark side. He must have been high maintenance and I bet Proust was high maintenance too. The Narrator tortures himself with such little things that I was really annoyed with him. Maybe Albertine is bi-sexual. Maybe she just want to have fun and escape the Narrator’s heavy stare and careful watch. Who would want to live under such a magnifying glass? I understand her wish to avoid him and have girl-time. Thanks a lot for all the links to my posts. I really appreciate it. I encourage everyone reading that comment to discover Proust and to read Molière. You can’t pretend to know anything about French lit if you haven’t read Molière. Thank you for reminding me of how much I loved this volume. I think that a lot of the humour in Proust is cumulative, many of my favourite jokes work because of previous conceptions built up by Marcel (for example, the irony that Charlus is gay after being presented as heterosexual in Swann’s Way). Looking forward to your thoughts on modern transportation in the books – it sometimes feels like late 19th century books are all about trains, but I’ve never thought of looking in detail at the evolution of transport for the C20th. Great stuff Max. Brought back many happy memories. And I agree about the humour. As others have said I’ve not managed to get past the first couple of volumes of A la recherche, many years ago. I hadn’t thought of Proust as a humorous writer, so after this impassioned piece and Emma’s endorsement I feel inclined to add it to the list again. As you probably know, Max, I’m not doing an official TBR20, but the pile does continue to grow…Btw, I’ve read varying accounts of the merits of this translation: any thoughts on that? I seem to recall some saying Moncrieff’s is too Edwardian and inaccurate? An inspiring post, Max. I really must give Proust a try. Having read the first two Knaugaards, I’m seriously considering abandoning that series especially as the reviews of books three and four have been somewhat mixed. I’m not convinced it’s a valid comparison, but either way I’m sure my time would be much better spent with Proust. I should give it a go at least. As you know Max, I failed on my Proust project, but I hope to give it another go later. Great cover BTW. Jacqui: Gert Loveday abandoned the series too. Max, you are now assuming the form of an on-going reproach to my reading stamina and habits. When you started on Proust I was midway through Guermantes. Now, a couple of years later, you have powered onto vol. 4 while I am – still midway through Guermantes. Oh well! Funnily, following your posts (I have only skimmed this one) the thing that strikes me is how much of the books I have retained. I feel pretty sure I could pick up Guermantes and dive back in. May try that later in the year. Rough, I think you’d like him. The size is an issue I admit. I find I have to have decent chunks of time to read him in. Trying Proust in 20-30 minute blocks is a recipe for misery. The tv show Caprica had one of the more interesting portrayals of gay life I’ve seen. It’s set in the distant future on an alien world, and the culture is sexuality blind. It’s not a major part of the plot, it’s not integral to the story, it’s just how they are. Where characters are gay nobody comments on it and it isn’t necessary to the character concept, it’s just a detail. It’s an oddly revolutionary approach, possible only in SF of course. In real life we’re a long way from that, so I think we’re not all that enlightened just yet. Emma, it’s incredibly rich. This is a particularly daring volume, and it’s remarkable how much territory he covers in this one volume. Agreed on the narrator, he’s more fun to read than he would be to date. Albertine’s sexuality is actually fairly hard to judge, because the narrator doesn’t really see her but more his desires and fears regarding her. I’d want to escape him too, she’s very patient though he is her best chance of a good marriage. Where would you start with Molière? Stu, it’s in translation, so you owe it to yourself to give it a go. There’s huge amounts of humour, though much else also. You just need a decent chunk of time to take a run at it. Shoshi, good point on the cumulative nature. One point I didn’t mention above is at one stage Marcel congratulates himself on how unsnobbish he is and how he sees a duke and a liftboy as equals. It’s incredibly reminiscent of Oriane’s remarks in the previous volume, which Marcel ridicules, but here as narrator doesn’t realise (though it’s evident to the reader) that he’s now committing the same hypocrisy she did. That only works from cumulative effect. The transport post will probably be in a month or so. There’s some really interesting stuff on this one on cars and planes. Simon, he’s not always humorous, much of it isn’t funny at all and as Emma says this volume is funnier than most, but it’s definitely a core element. It was the comic writing that actually got me started with him, I read a bit in a bookshop and found myself laughing as I read, and was sold. I can’t speak to accuracy, but Edwardian works for me here as that’s the period in question. I think the other translators helped update it, but the key advantage is the entire sequence is in a single translation which aids consistency. The Penguin editions have different translators for different volumes, which must impact the voice over time. Jacqui, as you know Knausgaard hasn’t tempted me. This is the source material for books like that (and of course Powell’s Dance to the Music of Time, which if anyone doesn’t know I’ve reviewed in full here). He’s worth giving a try. Guy, it’s not the cover I have funnily enough, but I couldn’t find pictures of mine online. It’s more a line drawing of a character, coloured in a light pink. It’s very effective, but I agree the flower also works well. I’ve had to abandon a volume twice and return later. It is a big beast, so I think there’s nothing wrong with finding it takes a couple of goes to get into. Ian, so it goes. I think you’re right that you could dive back in without too much trouble even after a couple of years. He’s very memorable.